Deep in the jungle primeval, Nepenthes attenboroughii awaits its furry prey. But N. attenboroughii isn’t a stealthy cat or poisonous lizard. It’s a plant, and it eats rats. So says a Popular Science article by Stuart Fox. 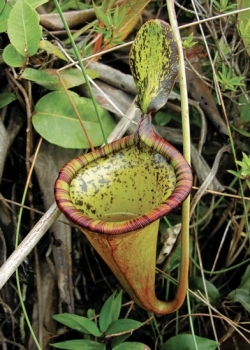 “A spectacular new species of Nepenthes L. (Nepenthaceae) pitcher plant from central Palawan, Philippines,” Alastair S. Robinson, et al., Botanical Journal of the Linnean Society, 2009, 159, 195–202. UPDATE (May 23, 2011): In the original version of this we attributed authorship to the wrong person. Stuart Fox wrote the Popular Science article. Sorry about the error, Stuart! Posted by Stephen Drew on Monday, May 14th, 2012 at 12:02 am under Arts and Science.